Pat McCrory Lost the North Carolina Governorship. Now He’s Trying to Steal It. North Caroline Gov. 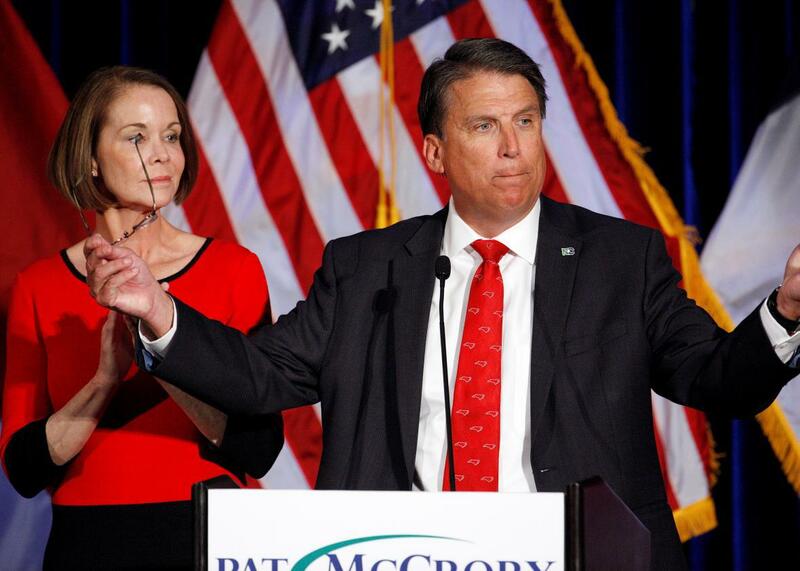 Pat McCrory vows to contest the results of North Carolina’s gubernatorial election, while his wife, Ann, looks on. North Carolina Republican Gov. Pat McCrory, champion of the country’s most notorious anti-LGBTQ law, lost his bid for re-election on Nov. 8—at last count, by 7,448 votes. Yet nearly two weeks later, McCrory still refuses to concede. Instead, he and his legal team are baselessly alleging that the results were tainted by fraud, petitioning election boards to review the results and determine their validity. McCrory is not so obtuse as to think he can actually overtake his opponent, Democratic Attorney General Roy Cooper, in raw votes. His strategy is more insidious: He seems intent on delaying the formal declaration of a winner—and delegitimizing the voting process—in order to let the Republican-dominated legislature ignore the true result and re-install McCrory as governor for another four years. This chicanery will be easier to pull off than you might expect. Thus far, McCrory has questioned votes in more than half of North Carolina’s counties. One attorney monitoring the proceedings called these challenges “silly, small in number, poorly researched and often defamatory,” which is undeniable: Republican-controlled county election boards have forcefully rejected McCrory’s challenges, concluding that there is simply no proof of widespread fraud or malfeasance as McCrory claims. Frustrated by these setbacks, McCrory petitioned the Republican-controlled State Board of Elections to take over the review process. The board refused, but it agreed to meet on Tuesday to set guidelines for how county boards should address complaints. The best part? Under the law, the legislature’s decision is “not reviewable” by the courts. Republican legislators can simply step in, overturn the decision of the voters, and grant McCrory another term. The courts have no authority even to review the legality of their actions. While McCrory works to reverse the results of his election, the legislature is contemplating a plan to effectively negate a state Supreme Court contest. On Election Day, voters ousted a conservative justice and replaced him with a progressive, tipping the court’s balance of power toward Democrats. Republican legislators so feared this result that they attempted to bar the progressive candidate from running, passing a law that was struck down as unconstitutional. Now they are floating a plan to pack the court, expanding it from seven to nine members—and allowing McCrory to name its two new members, thereby conserving its conservative majority. The legislature passed HB2 in 12 hours. It could ram through a court-packing bill just as quickly. This scheme, of course, would directly contravene the voters’ recent decision to move the state Supreme Court in a liberal direction. But North Carolina Republicans no longer care much about the will of the voters. Instead of accepting the results of the election, Republicans are attempting to entrench their power through a series of unethical, underhanded, and constitutionally dubious maneuvers. Their corrupt disregard for basic governing norms—their blatant preference for raw power over democratic legitimacy—should alarm us all. What’s happening in North Carolina is not mere politics. It is a perversion of democracy.